How will people find you at an event among the scores of other tradeshow exhibitors? An effective way is to leverage your company website to highlight your show participation in simple, creative ways. Follow these must-do 10 website initiatives. They complement other promotional activities you implement and can give you a leg-up in driving booth traffic. Add all shows to your web site. Whether local or international, each show is promotion for your company. On your own web site, the listing promotes you before the show and, thanks to search engines, can last forever. Even if you have the smallest space at the show, the listing implies you are an industry leader. Make sure the listings are not on your site for more than a year after the event. Your dealers and distributors should be linked to your tradeshow site, so the information filters down to an individual buyer who may be attending. Us a graphic or other type of image to highlight each of your exhibits for each listing. Even if you have a small space, say a 10x10, surely there is something unique about your exhibit – one dominant image, a new sign, a photo of a give-away, the grand prize. People love to see photos, so add photos of your exhibit staff for each show. Photos will make your staff more approachable by strangers, either coming to your booth or during other activities at the show. Focus on your physical location at the event. Provide a floor map and highlight your spot. Why? So folks will be looking for you. Heavily promote your booth number. Be careful if you are in a special hall. For large shows, be sure to differentiate your location from other tradeshow exhibitors. So prominently indicate if your space is #1472 – East or West, North or South, or by another name (hall designations). Provide admission tickets from show management on your site. Put in a deadline date for mailing or pick-up. Make it simple for people to contact you before the show to set appointments during the show. This allows you, and your visitor, to plan during a very compressed time frame. If you are sponsoring a speaker, hospitality suite or workshop at the show, include relevant links to the show site or speaker biography to promote your special association with the event and get your money’s worth. 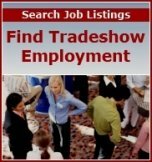 Most people won’t look at your site unless you tell them to look at your site for tradeshow information. Do this in person, via mail, social media and/or e-mail correspondence. Above all, fully leverage your web site as a powerful tool in tradeshow marketing. For other digital marketing strategies, please see the articles listed below. This article on website marketing tips was written by Julia O'Connor, president of Tradeshow Training, Inc.